Whether it is a simple tooth extraction or full reconstructive surgery, the oral surgeons in Houston have the training and experience to meet your needs. There are many oral health issues that are beyond the abilities of your regular dentist to handle, and in these cases they will recommend that you contact an established oral and maxillofacial surgery office in Houston to receive the specialist diagnoses and procedures that only they can provide. Houston is well-known for having some of the best oral and maxillofacial surgeons in the country, so you can feel safe in the knowledge that however big or small your dental care problem, these surgeons are ready to get you back to your beautiful smiling self. What Is an Oral or Maxillofacial Surgeon? Oral and maxillofacial surgeons are practitioners in one of modern dentistry’s nine areas of specialization. The specialty area is more commonly called just “oral surgery”. It is dedicated to the diagnosis, surgical procedures and adjunctive treatment for a variety of injuries, diseases and defects in the look and function of the human mouth, teeth, jaws and face. 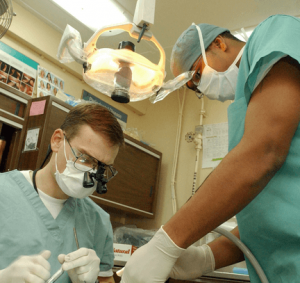 What Conditions Require an Oral Surgeon in Houston? Oral surgeons are called upon when the primary concern is the establishment of solid long-term dental health, as opposed to the primary concern being cosmetic or aesthetic. This does not mean that oral surgeons are not concerned with how the mouth, teeth and face appear, but rather that they are only called upon in serious situations where the safe application of surgical techniques is the primary area of concern. Below is a detailed list of the 3 best oral and maxillofacial surgery clinics in Houston. Also look here for emergency tooth extraction dentists in Houston. Dentist: Paul S. Metz, D.D.S., M.D., Shelley Seidel, D.D.S., M.D., John Orfanos, D.D.S., M.D. The Houston oral and maxillofacial surgeons at OMSH are the region’s leading team for all manner of dental implants, from missing teeth to full denture replacement. The OMSH clinic is famous for its unique “Teeth-In-A-Day” service, where you can receive a full dental implant plan and placement in one single visit for an amazing low price. On top of specializing in dental implants, they cover the full range of oral and maxillofactial surgery in Houston. With more than 20 years as the leading experts in dental implants in Houston, this clinic is the obvious choice for major dental implant surgeries. Dentist: Donald Cohen, D.D.S., M.D., Christopher Dauterive, D.D.S., M.D. Houston Oral Surgery & Dental Implant Center starts building a foundation of trust with each new client by focusing on the individual needs of their specific oral health problems. Their focus is on providing long-term preventative care, instead of only repairing oral health damage after it happens. Your treatment is planned out according to your needs from the first x-ray down to how you will get home after the surgery. This commitment to comfort and compassion helps patients overcome any anxieties and fears that they may have about dental surgery. The team covers the full range of oral and maxillofacial surgery in Houston. Dentist: Dieter J. Moya, D.D.S., M.D. Dr. Moya practices the complete range of oral and maxillofacial surgery in Houston, with special focuses on dental implants, wisdom tooth removal and oral pathology. He also has extensive experience in the diagnosis and treatment of facial pain, TMJ disorders and facial injuries, which can be very complex and require substantial knowledge and experience to handle safely and effectively. The highly-trained staff are able to apply the full range of pre-surgery sedatives, so all procedures can be performed in the comfort of their office. Dr. Moya also has extensive lecturing and teaching experience, and has presented at a umber of conferences and in prestigious dental journals on topics ranging from cosmetic procedures to oral diseases. Houston residents with serious dental health issues are fortunate to have access to so many highly-trained and experienced oral and maxilliofacial surgeons. When a regular dentist is not enough to deal with your issue, then you want to hire the best oral surgeons available to ensure that your long-term dental health is safe in their hands. Dental health issues can quickly turn into major risks for your overall health, so they need to be handled quickly and efficiently by the best professionals available. If you need a good oral sedation check this sedation dentistry clinics in Houston.